When I book sporting events it’s very rarely because I’ve heard much about it, but because it’s an excuse for a weekend away. Swansea was no different; five friends and I booked the event around a weekend in Mumbles. Mumbles makes up part of the half marathon route and is as cute as it sounds! The race was on the Sunday so we all decided the best way to prepare on the Saturday was to go for a 9 mile walk on parts of the route and find the best ice cream shop (it’s Joe’s Ice Cream!) followed by a dip in the sea (a balmy 14 degrees!). Shortly after, the weather turned from dry and cloudy to very (very) wet. The following morning we had breakfast and dressed ourselves in wonderful pink recycling bags. After being dropped off near the start line, we waited in our pink bags in heavy drizzle. I was assured by numerous locals this was a standard Welsh summer and not to worry. Before the race I was very worried about a niggle I’ve been having in my calves, caused by a painful ‘Forest 5’ run only a few days before. In that particular race, I finished 6 minutes slower than planned, had several spells of walking and a marshal suggesting I should probably retire from the race from the look on my face. With this on my mind I really didn’t expect much in the way of speed on the Swansea half. I’d decided in my head to be happy with 2 hours but deep down believed it would be nearer 2:05. When the race horn sounded the rain seemed to stop (in my mind it was instant, however it was probably a few minutes after) and we were off!! For the first 3 miles, I was running with an old university friend and after we’d put the world to rights, planned our next weekend away and agreed to go for lunch (beer) after the race we realised we were running ahead of the 1:50 pace makers. I was delighted but he was slightly concerned and went off ahead. When given the time to be alone in my own head I gave myself a full mental physical check… all was ok and the sun was breaking through the clouds! 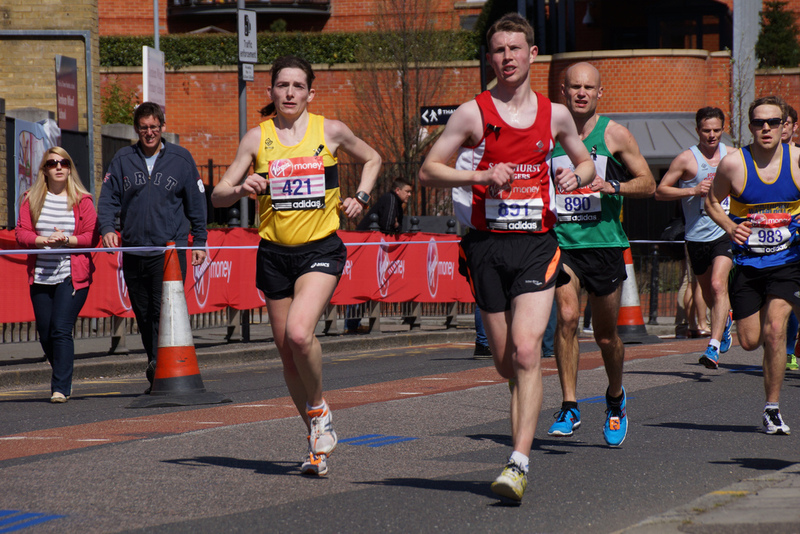 It was this moment I realised if I stayed ahead of the 1:50 markers I would get a new PB. I decided to go for it. The Swansea half starts in Swansea centre and goes along the sea road through Mumbles and then loops round before coming back along the sea front. This makes for a perfectly flat route. As you’re running around Swansea bay for most of the route you can see the half way point and roughly where the start/finish line is. It also means that the supporters (which embraced the wet weather and gave brilliant support all the way around) can support people before and after the half way mark. By the half turning point the sun was fully showing how beautiful the Welsh coast can be. This also meant more supporters and (finally) jelly beans! The support along the front ranged from people cheering from their balconies to a man in a Donald Trump mask cooling people off with his garden hose. At the 9 mile marker I was certain of a new PB, this was the point I had to start pushing to maintain the pace I was running. The end of the race is slightly deceiving as the route goes over a few bridges, has a few twists and turns, and a cobbled incline. This made pushing for finish quite challenging as my legs felt like they wanted to stop but I knew I couldn’t afford to slow down now. The finish line is along the high street with fences either side and hundreds of cheering supporters. Like all runners I wanted a sprint finish, I could see the clock time getting closer to 1:50. This meant I had no choice but to sprint as fast as I could! I crossed the line on a clock time of 1:49:52! I’d done it! Pub? The Swansea half won an award last year for being one of the best half marathons the UK has to offer. I didn’t really understand what makes a great half marathon but this one was great! This of course could be romanticised by the new PB or it could be the excellent organisation, the great support despite the weather and the stunning views over Swansea bay. Either way I’d happily recommend a Sandhurst Joggers weekend away for it next year!